Garza West Transfer Facility is a mixed medium security prison located in Beeville Texas. The unit can house up to 2,278 male offenders of G1, G3, and transient custody levels. Co-located with Garza East, Garza West is situated on 304 acres. 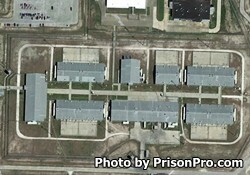 Garza West Unit is responsible for the initial intake and processing of offenders from the surrounding region into the Texas Department of Corrections. During the intake process offenders undergo a variety of tests and assessments including a substance abuse screening. After intake offenders are assigned a security classification and may be transferred to a long term commitment facility that best suits their rehabilitation needs. While incarcerated at Garza West, inmates can receive medical, dental, and mental health services. Educational classes provided at Garza West include literacy, adult basic education and GED courses. Because this is a transfer facility, manufacturing and agricultural operations are limited. Garza West Unit has visitation on Fridays, Saturdays and Sundays from 7am-5pm. Normal visits are up to two hours long, special visits for visitors traveling over 300 miles can be up to four hours in duration but must be requested well in advance by contacting the facility.